“Mean Jeanne” Gioia has led an interesting life, and she’s lived to write about it. Chaos: An Unauthorized Autobiography tells the (often humorous) story of this spirited woman who has lived her life with no regrets. We were pleased to take Jeanne’s manuscript and turn it into a professional book. Chaos was published under our Proving Press imprint and is now available on Amazon.com, as well as all other major e-book markets. 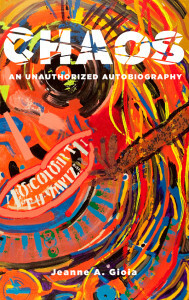 Find Chaos: An Unauthorized Autobiography here. Jeanne chose The Solution package, and we got started on her book right away. Chaos was professionally edited, and our team of designers got to work creating a great-looking book cover with the artwork she provided. We formatted the interior text of the book for both print and e-book markets, while incorporating some of Jeanne’s photographs into the design. When the book was ready, we uploaded it to all major print and e-book retailers. Since we’re handling the book distribution, all Jeanne has to worry about is writing the sequel! Along the way, Jeanne had a dedicated point of contact. When she had a question, or wanted an update, there was always someone ready to take her call. We’re committed to making the publishing process simple, professional and enjoyable for our authors.